The name of this ink harks back to the novel “Doctor Zhivago” by Boris Pasternak, set during the turmoil of the Russian Revolution. The label shows numerous Russian emblems – too many to try to identify, even if I could. The standard 3oz bottle leaked a little in transit. The box suffered the most, so I didn’t include it in the usual group photo and the label was partially disfigured. 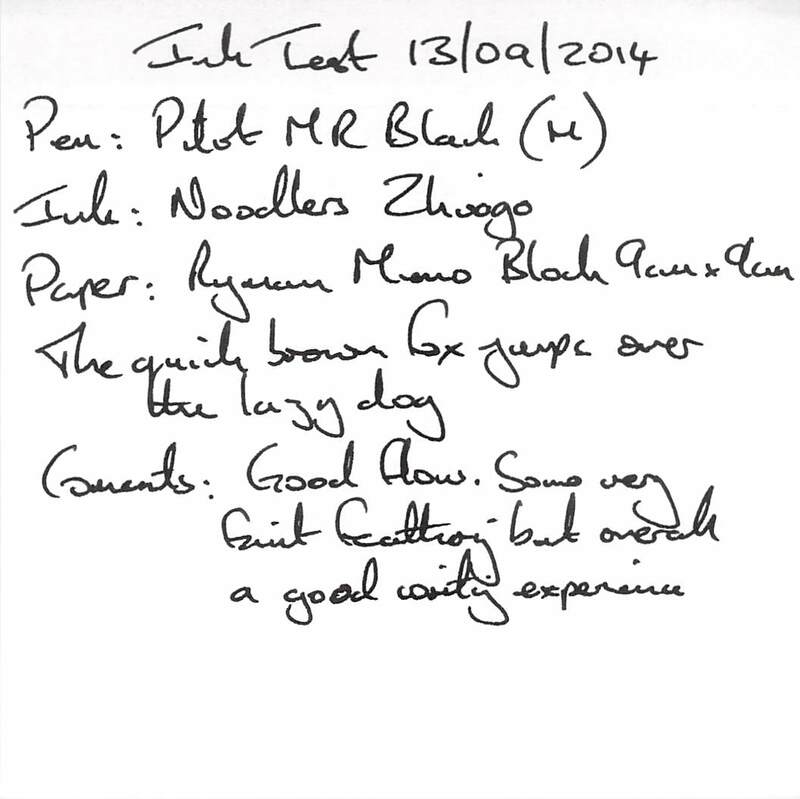 The bottle came from my preferred Ebay supplier and so I would consider the ink moderately priced. 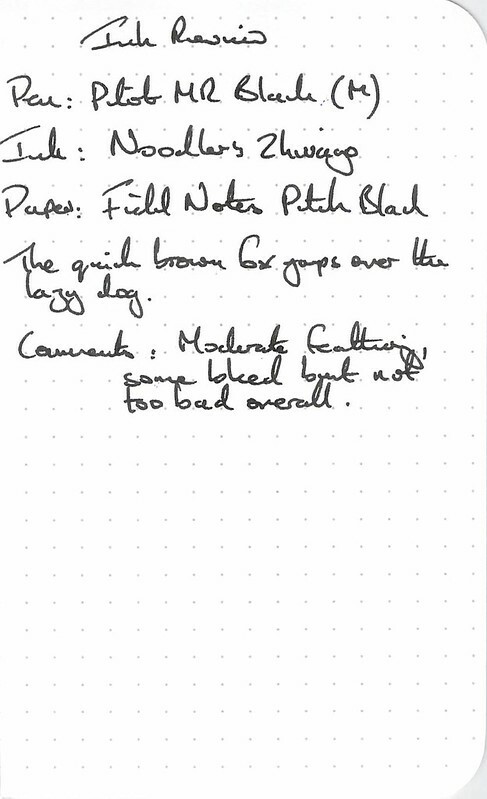 The test pen in this case was a Pilot MR with a medium nib. Water resistance was moderate to good. Cleaning was okay, but with some sooty deposits which took a little longer than normal to remove. The drying time was around 30 seconds. 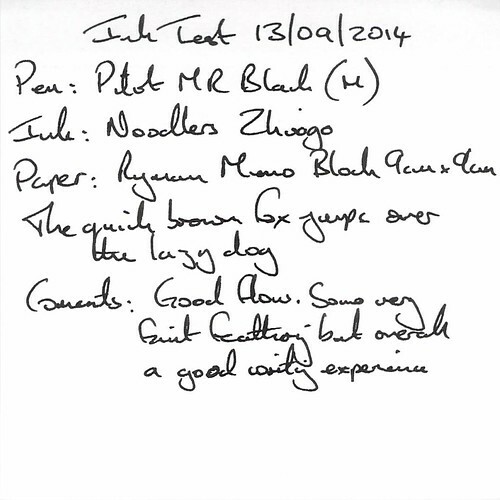 Many reviews of this ink describe it as a very dark green or green/black, and the green accents on the label echo this. 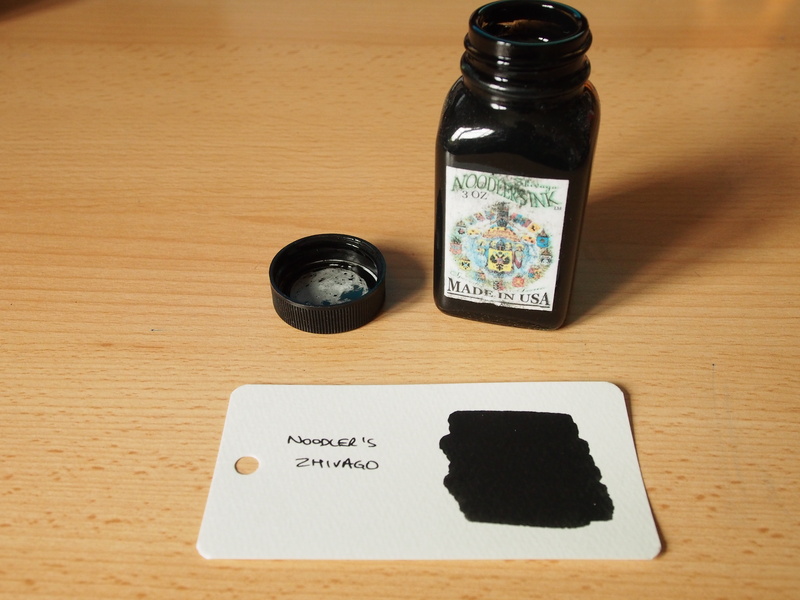 However, I could see only the merest hint of green in this particular bottle of ink, and probably could only see it because I was trying very hard to. 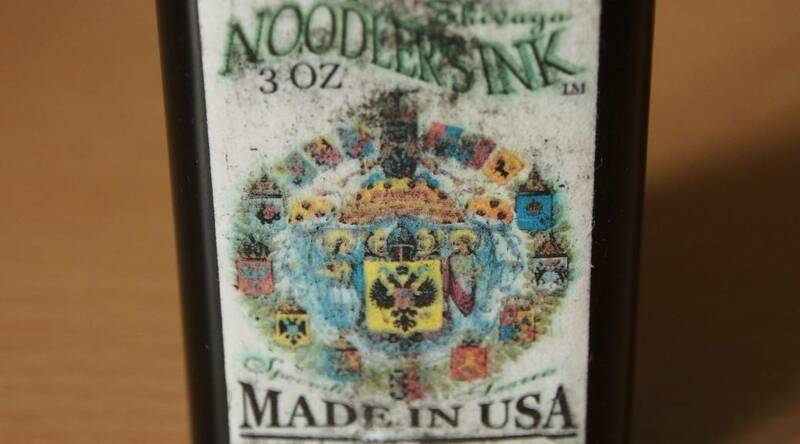 The Noodler’s website refers to this ink being of “variable combination” on a per bottle basis, which is intended as a security feature. This may explain the lack of green in this particular bottle. A nice regular line with minimal shading. As good as it gets for a black ink as far as I am concerned. The only drawback is that even once fully dry it was possible to smudge the ink by rubbing hard. A little feathering, but still satisfactory. 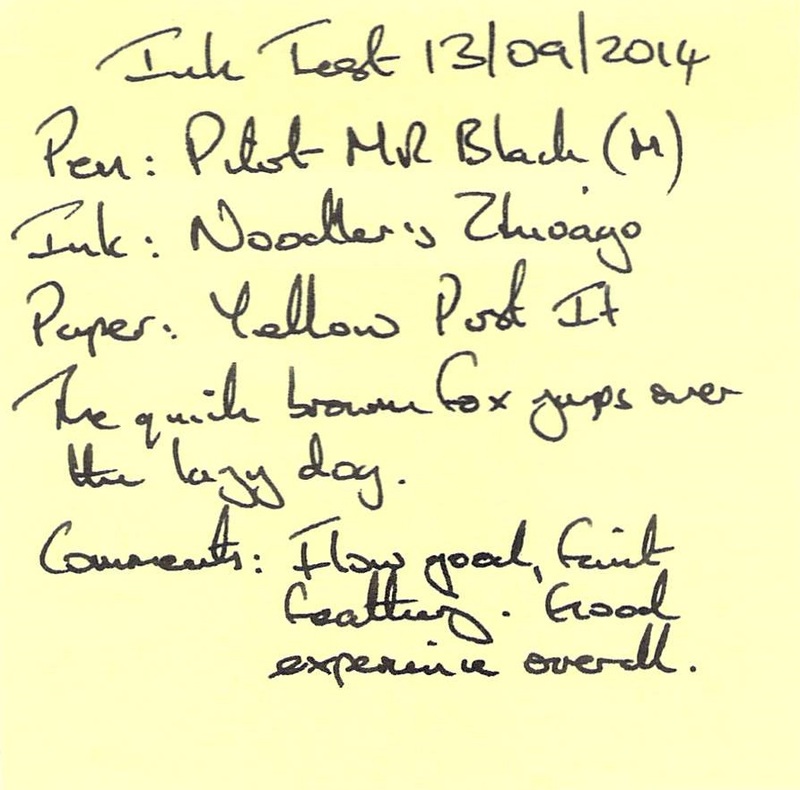 It was still possible to smudge the ink by rubbing hard. Still a little feathering but the coverage is okay. Satisfactory overall, and I couldn’t see only smudging on rubbing. Not great, but compared to some other inks this isn’t too bad. No smudging was noted on rubbing hard. The texture of the card shows exposes a little more shading than is typical on a smooth surface. 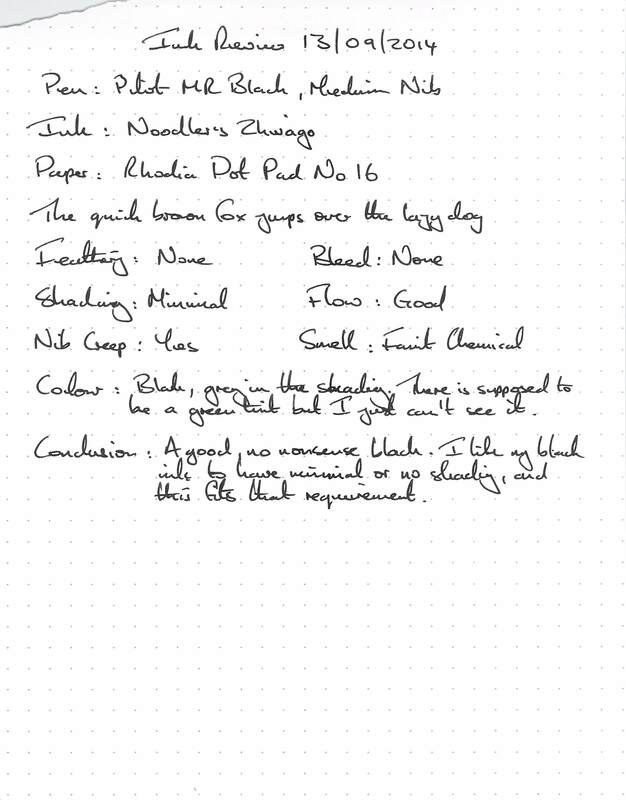 I really want a black ink that looks like staring into an abyss, and this may be as close as I am going to get on a Word Card. It’s good to finish this batch of reviews on a high note. 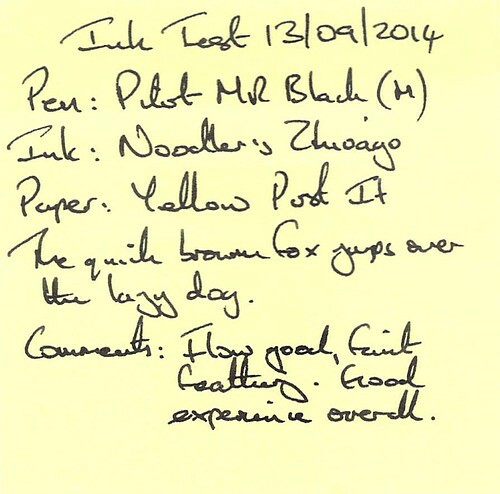 This ink will definitely feature in my rotation in the future. There’s only one other black ink that comes as close to my ideal black ink as this one, and as I haven’t reviewed that ink yet, that will remain a mystery for the time being. 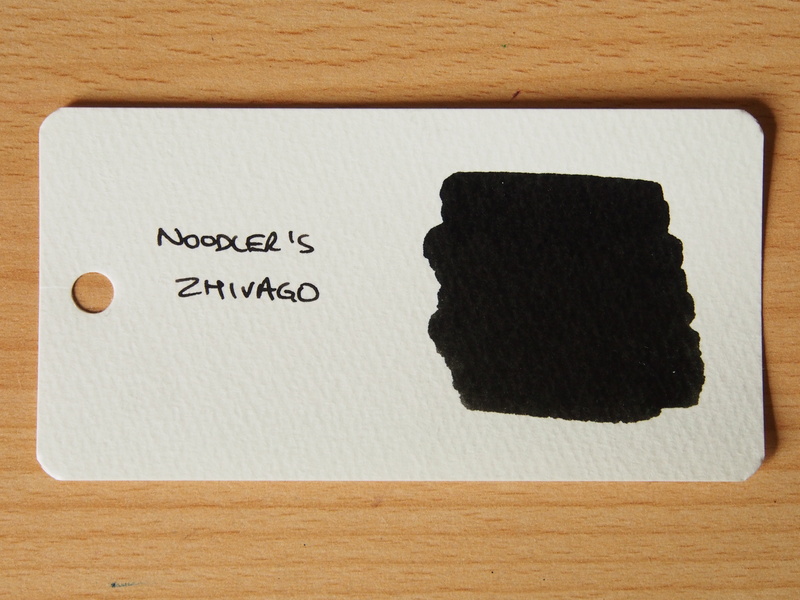 While Zhivago smudges a little on smooth paper when rubbed hard, I’ve not been testing for that with other inks so I won’t worry too much about that. I also have a slight reservation that if I buy another bottle of this in the future the “variable combination” may mean the ink performs differently, but only time will tell on that.